+ Understand why and how people invest in real estate. + Learn about the pros and cons of investing in collectibles. Part I – What are real assets? Some investors include real assets in their portfolios to increase diversity (more on how diversification works in topic 4.1.) Real Assets are tangible, usually physical, assets rather than financial assets like bonds and stocks. The more common real assets are real estate, natural resources like oil and gas, precious metals like gold and silver. Real assets also include art, wine, cars, and collectibles. When an investor buys a share of a company, they are investing in physical assets–the productive capacity of the company. But they do so indirectly. A shareholder does not own a company lathe, or a company laptop computer, although the money raised by selling shares could have bought those assets. An investor in real assets can buy and own the real physical thing. Most people don’t want to own a barrel of oil, or a ton of coal, or even a bar of gold. While some people own a house, they don’t want to own an office block, or an apartment complex. But some do. The value of investing in real assets depends on the market for real assets. If an investor owns a piece of land in downtown Albuquerque, and companies are looking to locate their offices in downtown Albuquerque, then that land, and the office that can be built on it, is likely worth more than the purchase price of the land. If demand for a real asset, say gold, falls, then the price of gold will fall, and the return on an investment in gold will fall. The most common real asset people invest in is their house. The one they live in, so it’s not really an investment, but more of a consumption good. But in common thought, people buy a house to live in, and hope it turns out to be a good investment! Since 2008, it hasn’t been a good investment for many people in the U.S. In the world of finance and investing, investing in real estate means investing in property other than your primary residence. People buy houses to rent, so that the property produces an income stream, which is taxable, but any related expenses are deductible against that income. People, or more likely groups of investors, buy commercial property to lease, again to produce a flow of income. Sometimes the value of the property increases over time, and investors realize a capital gain on the property, but against this is the depreciation of the property, which works to lower the value of the property. Investment properties must be managed, not only to maintain them for health and safety, but because they lose money when vacant. Many investors use property management companies to advertise, screen tenants, collect rents and handle maintenance. The associated costs, while tax deductible, directly reduce income and return from the investment. So you want to invest directly in real estate, and buy a house to rent. Good plan: have the tenant pay off your mortgage, and you end up with a real asset that’s worth quite a lot of money. But what kind of investment is it–in other words, what’s the effective annual rate of return, compared to an index fund, for example? Consider an example: Nice house bought for $150,000. To avoid PMI, you put down 20% (more on this later*) of $30,000. Your monthly mortgage, plus escrow payment is $1,100 and you rent through a property management company for $1,100 a month. Your actual income per month is lower than $1,100 because you pay a management fee, and there’s some maintenance, and maybe you pay the water bill. You pay tax on the income, but you get a deduction for the mortgage interest paid. You’re out about $300 per month after all this–that is, your rental income is $1100, but you pay fees and maintenance. You pay tax on the gross income, but you get to deduct costs, and interest paid. All said and done, your net income is about $800 per month, although you don’t see this at the time. Over a 15 year period, the house might be empty a few months which increases your costs, and lowers your income, property taxes rise over time, as do fees, but hopefully maintenance remains about the same. Let’s say it ends up costing you about $40,000 net over the 15 years. (Remember you have to rent for quite a bit more than your monthly payments to avoid this loss.) After 15 years you’ve “invested” $70,000 into the house. If housing values rise by 3% per year (note this is close to the long run rate of inflation, so the real value of the house stays constant) then your house is worth about $235,000. 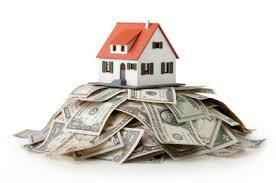 Subtracting your investment of $70,000, the gain is $165,000 which represents about 8.4% return per year. This compares well to the long run annualized rate of return of the S&P500 Index at around 9%. Investing in this house is about as good as investing in the stock market. But there are a lot of variables, including your initial downpayment (equity), rental rates, maintenance costs, vacancy rate, the housing market in the future, when you want to sell the house, and of course, what the stock market is doing at that time. Many people have made money investing in real estate, but many have also done poorly, and could have done better by investing in the stock market. * If you put less down on deposit–to leverage your investment more–you end up paying PMI, and borrow more, so your monthly payment is larger. Your monthly loss will be higher, so your total cost over 15 years might not be so much less than in the example above. It’s not obvious that less initial equity leads to a higher return on investment. There is a National Association of Real Estate Investment Trusts (NAREIT) which is an industry group with the goal of organization, representation and education. While set up like a mutual fund, REITs must pay out at least 90% of earnings as dividends each year, so they are income sources, like bonds, more than sources of capital gains like equities. REITs are now global, and vary considerably in the portfolios of properties that are owned. Properties are generally commercial, such as office buildings, shopping centers, warehouses, but can also include schools, homes, apartments, and cell towers! REITs offer investors a diversified real asset portfolio without the headaches of property management. Like mutual funds, they charge a fee for managing the portfolio. The most common way people invest in commodities is through Futures Markets (and we will cover that in a future topic) but some investors decide to hold the actual commodity. This is more likely with gold than with oil, for example! Even holding quantities of gold exposes the investor to risks of theft, and gold is not as tradable as financial instruments (securities.) Few people are interested in accepting bars of gold when selling a car, for example. Other than commodity futures (which are derivatives, to be covered in a later topic,) there are commodity ETFs that are traded on stock exchanges. Another way to invest in commodities is by investing in the stock of companies that produce or trade in commodities. Many people invest in oil by investing in oil companies, for example. There are many stories of people making LOTS of money buying specific things–art in particular, as investments. (Saatchi Online is a website presenting artists to invest in, for example.) A February 2013 article in the Financial Times reports that fine art returned 200% over the ten years 2002 to 2012. The same article reports a 10-year return to classic cars of almost 400%, fine wine of 166% and 76% to high-end watches. Most of these markets are dominated by very wealthy collectors interested in conspicuous consumption as much as flipping the items for a quick capital gain. People are attracted to investing in collectibles for two reasons: they know something about them, and/or they are looking for diversification in their portfolios. It is often claimed that the prices, and hence yield, of collectibles is uncorrelated with the return on financial assets like stocks and bonds. There may even be a negative correlation such that the prices of collectibles goes up when the stock market values go down. Investing in real assets, and this category in particular, is seen as a hedge against poor performance of the more traditional asset classes of stocks and bonds. Information about collectible markets is much harder to find than for traditional assets, as many sales are private, while others are spread over time and space. Art, wine, cars and antiques are generally sold at auction, but not all transactions are reported, and many trades occur outside formal markets. The information available can be biased, favoring the large gains, while large losses are not reported–people rarely brag about how much they lost on their 1967 Mustang sale. Hagerty, an automobile insurance company has recently found success creating indexes of collectible car prices. Auction prices show considerable variability, due in part to specifics of the item for sale, but also dependent on the buyers present at the event. Markets for collectibles are often “thin,” meaning that there are few buyers for a particular item at any one time. This tends to lower sale prices, and hence value. Those who invest in art tend to enjoy looking at art, those who invest in wine tend to know a lot about wine, and drink a lot of it. (Also see the Aside.) Collecting baseball cards and comic books can start as a child, and one day someone tells you they are worth a small fortune. It’s then that you realize it has all been an investment! Sometimes a collection becomes an investment, but few people who don’t drink invest in wine, and few people who care nothing about cars invest in cars. Despite what you may hear, the road to riches isn’t lined with Franklin Mint Kate Middleton dolls (originally sold for $199, now selling on Ebay for about $190.) Investing in wine can match the returns to equities over a long period, but only for very select wines. Although the Antiques Roadshow is entertaining, and thousands of people attend each show, bringing nic-nacs, heirlooms and rubbish for appraisal and the hope of being one of the dozen or so people featured on the broadcast, it’s more entertainment than investing advice. Here is a graph from The Economist magazine showing average annual returns to various real assets over the last 118 years. Thanks to SpeedTV’s broadcast of Barrett Jackson car auctions, more people now see cars as something other than just transport. Many families have more than one car per person, and some people have lots of cars. Those with large car collections tend to specialize in a particular marque (Ferrari, for example) although there are exceptions such as Jay Leno, and Ralph Lauren. Why? It’s because making money investing in cars (even if that’s not Jay’s main objective) requires very specialized knowledge about what you are investing in. This is a more general principle: people who are ignorant about art, or antiques are unlikely to make money buying and selling art or antiques. Although the return on the investments these people make appears to be large, if it is corrected for the investments they make in knowledge (specific human capital,) experience and time spent, the adjusted returns are not that much higher, if at all, than investing in traditional financial assets. Investors in cars receive a reasonable return to specialized knowledge. The counter argument is that these people enjoy cars, and investing is just an added bonus. But there are many people who gamble for the enjoyment of it, but they aren’t investing. Buying cars to drive is one thing, and having lots of them to drive is certainly a bonus, but the opportunity cost of owning all those cars is real and large. There are many other things to invest money in that also provide enjoyment. Some people even enjoy investing in the stock market! Successful investing is hard work, and nothing is more challenging than being a successful investor in automobiles. Write a one-page essay on the topic of investing in real assets — would you recommend including any real assets in a balanced portfolio? If so, which asset(s) would you include and why? Most wealthy people own real estate. Are they wealthy because they invest in real estate, or do they invest in real estate because they are wealthy?